Tourists in India almost never skip a visit to the Taj Mahal. Often they include a Taj Mahal day trip in their itinerary, as it’s definitely one of the most popular landmarks in India. Even though some may find it a disappointment because of the huge crowds that go there, we actually had an amazing experience during our visit. The Taj Mahal is one of the Seven Wonders of the World and has a very rich history. 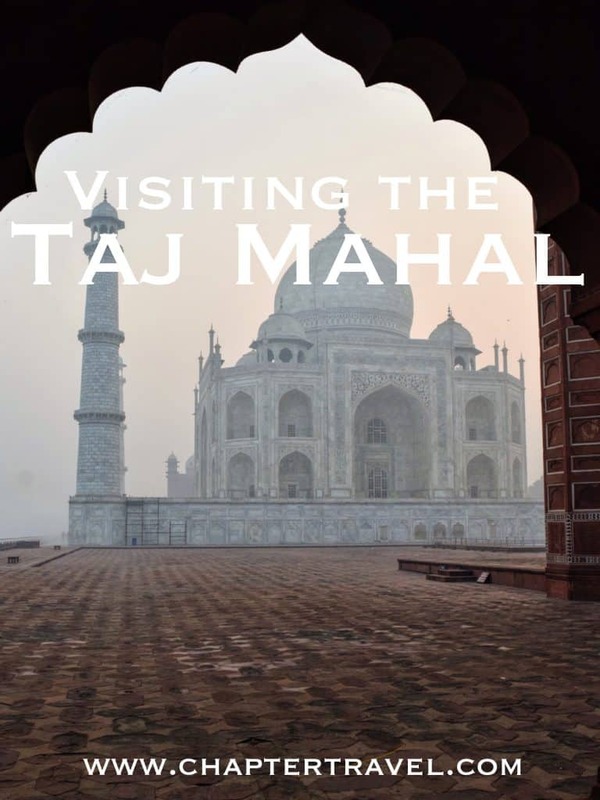 In this post we will share our experience at the Taj Mahal and various tips for visiting the Taj Mahal. For instance, information about Taj Mahal Day Tours, how to get to the Taj Mahal, what the best time is to visit the Taj Mahal and tickets for the Taj Mahal. 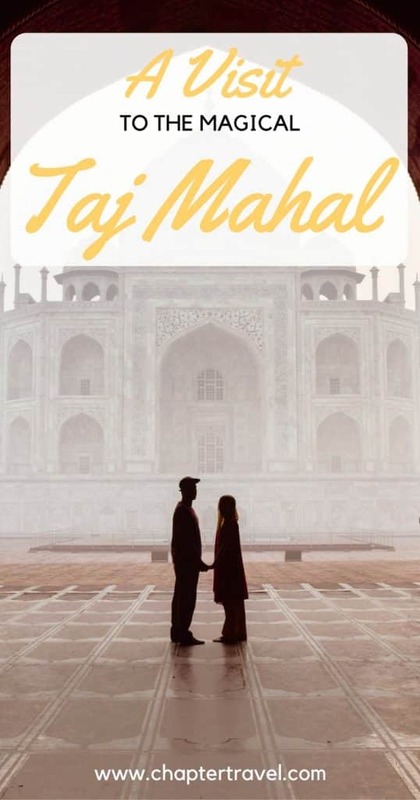 We also discuss the true love story behind the Taj Mahal. If you’re here to look for some good day tours for the Taj Mahal, I’ll help you out right away. A tour can be a great option for the Taj Mahal, since it’s a bit out of the way and will make it a bit more comfortable. Usually I would not say to book a tour, but India can be overwhelming and a tour really makes it a lot more comfortable. So if you have the budget, I would definitely consider a day tour to the Taj Mahal. For instance, Get Your Guide offers a day trip to the Taj Mahal during sunrise. The sunrise is the best time to visit the Taj Mahal, as it’s usually less crowded and of course absolutley amazing to experience. If you book a tour, you don’t need to worry about buying your tickets before it opens and so on. If you rather want to do Taj Mahal DIY style, like we did, read on for various tips for visiting the Taj Mahal below. The Taj Mahal is located in Agra, the state of Uttar Pradesh, about 200 kilometers away from Delhi. It can be visited during a day trip from Delhi, or you can stay in Agra. We decided on the latter and stayed in Agra for two days. It’s possible to get to Agra with the train from Delhi, or with the bus from any other place. We travelled by local bus from Jaisalmer to Agra, with a stop-over in Jaipur. TIP. Take the Gatimaan Express: We took this train when we went back to Delhi after visiting the Taj Mahal. It is definitely more expensive than the slower train, but it’s really so much more comfortable! You even get food included, water and a desert. The train ride is only 100 minutes, which is really fast in India! With the normal train it would take you about 4/5 hours. Price Gatimaan Express: 690 rupees per person (about 10 $USD/€). Generally, it’s very hot in the summer months in India. Not everyone can stand that heat. Therefore, it might be better to visit the Taj Mahal during the cooler months October to March. If you have done any research on the Taj Mahal, you’ve probably already heard this tip before. The best time to visit the Taj Mahal is definitely during sunrise. Not only is it absolutely beautiful, but it’s less crowded too. It really differs per day, but during our visit it was completely empty the first few minutes. But we’ve also heard that there can already be a line at sunrise. 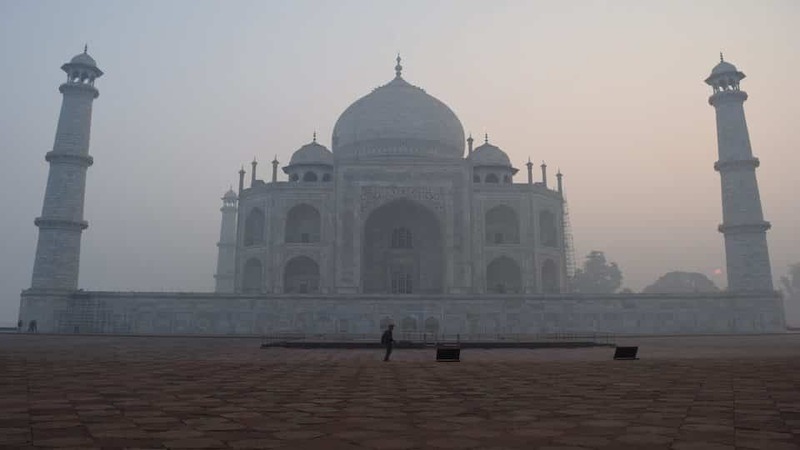 Please be aware that the Taj Mahal opens as soon as the sun comes up! You can buy the tickets for the Taj Mahal at the ticket counters, these are located somewhere else than the Taj Mahal itself, but it is a walkable distance. The tickets can only be bought the day you actually visit the Taj Mahal and not days in advance. Entree fee for foreigners: 1000 rupees (about 14 $USD/€). Entry gates: There are three gates: The West Gate, East Gate and South Gate. We went through the East entrance, which is less common. Therefore, you’ll be faster as the lines are less long. The main one is the West entrance, which is more accessible if you go by rickshaw or car. We suspect the South Gate is a less busy gate too, but we haven’t tried it. The Taj Mahal is considered to be one of the most beautiful creations by men on this Earth. One of the things we love about it is the story behind it. The story dates back to 1631. This was when Shah Jahan, the son of the fourth Mughal emperor of India, promised his wife Arjumand Banu on her death bed to never remarry and he will build her the richest mausoleum over her grave. They had met when he was walking down a bazaar, and he saw her hawking silk and glass beads. It was love at first sight. In the year 1628 Shah Jahan became the Emperor and gave Arjumand the royal seat. She also received the title “Jewel of the Palace” or “Mumtaz Mahal”. Yes, he had other wives too, but she was his favorite. She never left his side. Mumtaz Mahal died giving birth to their 14th child, breaking Shah Jahan’s heart, but it inspired him to create the world’s most beautiful monument. It’s now considered to be one of the Seven wonders of the World. Building the Taj Mahal took 22 years and about 22.000 workers. When Shah Jahan died, his body was also placed in the tomb next to his most loved wife. 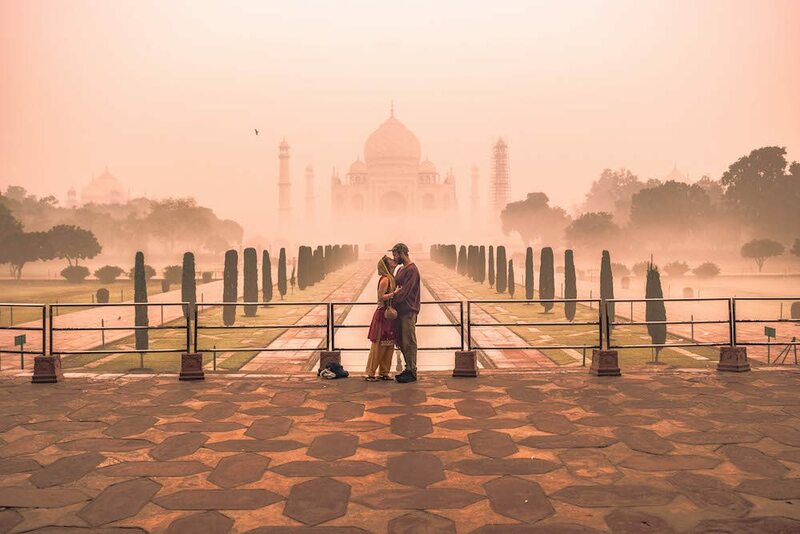 Before we went to India, I told Jeffrey that I don’t care where we go, as long as we include the Taj Mahal in our itinerary. I know India is a big country and there is lots to do and so much to see. But as long as we would see the Taj Mahal, I’m would be happy. Usually, I’m more interested in unknown and untouched places, but somehow I have always been interested in the Taj Mahal. I didn’t care if it’s a tourist trap and super busy. I guess I just wanted to see what all the fuss is about. So, this morning we woke up extra early to visit the Taj Mahal. 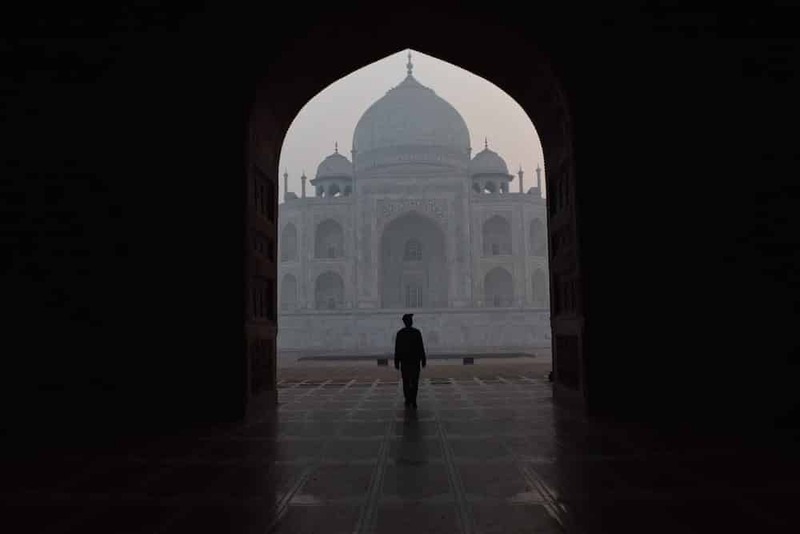 We’ve heard from a lot of people that it’s best to visit the Taj Mahal during the sunrise, because it’s less crowded. Even though at first I really wanted to visit the Taj Mahal, my excitement had subdued the days before. 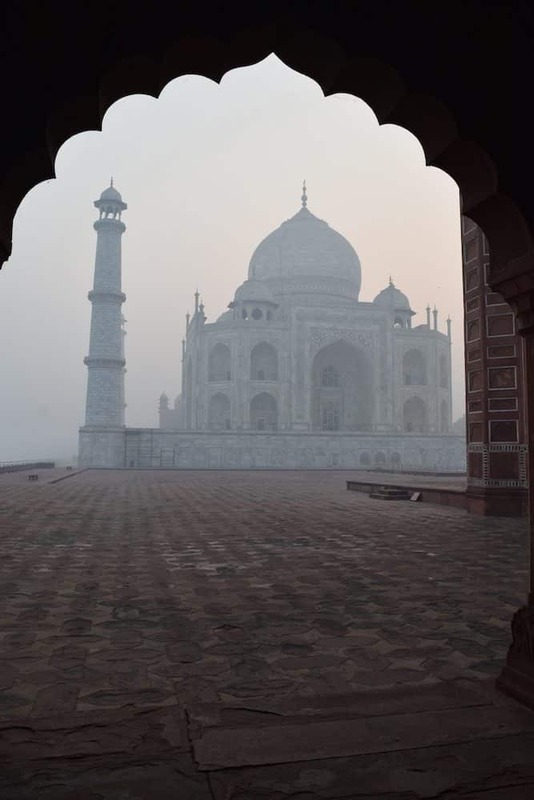 It had been so foggy at the Taj Mahal. 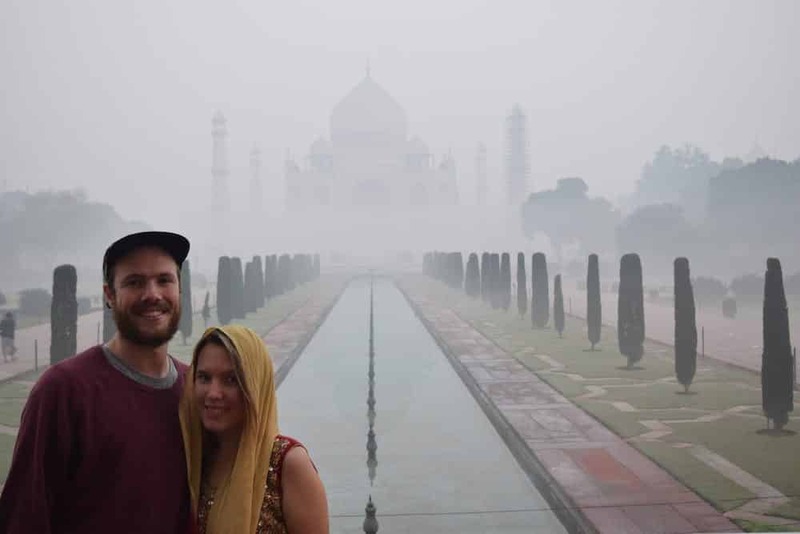 We have seen so many recent photos where you couldn’t even see the Taj Mahal if you stand a few meters from it. Also, India had made me so… tired. 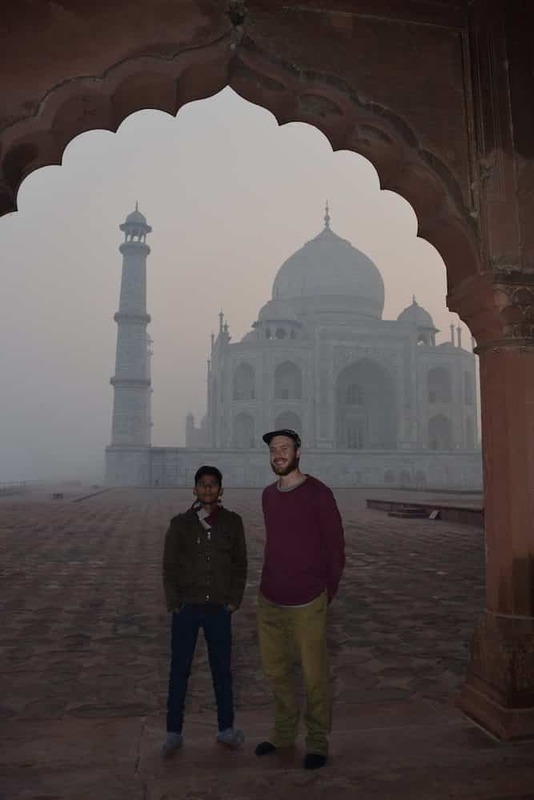 So when I arrived in Agra I was unhappy: it was cold, it was kinda dirty and our hotel wasn’t great either (although the location was perfect for visiting the Taj Mahal). So, this morning, when our alarm clock went off at 5 am, both Jeffrey and I thought to ourselves, “why are we doing this! ?” We snoozed until 5.30 am, eventually got up, got dressed and went to the ticket counter. Luckily, our hotel was very close, so we could easily walk to the ticket counter and to the entrance of the Taj Mahal (two different places). We arrived at the ticket counter at 5.50 am and were surprised to see we were the first ones there. Because we have heard that people start lining up around 5.30 am. It isn’t possible to buy your tickets the day before, you really have to buy a ticket for the day that you go. Eventually a line was starting to form behind us. The ticket counter didn’t open until 6.30 am. We got our tickets at 6.30 am, and I told Jeffrey “There is probably already a line before the Taj Mahal”, which always opens at sunrise. I had heard that people hire special organizations to buy them tickets, so that they can already line up before the Taj Mahal. Since we saw one man buying ten tickets – he actually cut in line before us, we thought there must already be people standing there. But when we got there, there was only one other girl standing before us. It was probably because of the fog and the recent money issue in India, but we were the second in line. The girl behind us told us that she had visited the Taj Mahal during the sunrise a few years ago. It was a lot more busy then and the lines were crazy long. I just couldn’t believe it. Now, we were the second ones in at the East Gate. I just couldn’t believe it. Now, we were the second ones in at the East Gate. Seconds after the gate opened, we were in. We walked fast to avoid any big groups of people around us, but when I looked behind me, I didn’t even see anyone. There was a local young man named Raja, who started walking with us. He showed us all the good spots to take photos. Apparently, he worked there, although I’m not sure what is job was (taking pictures of couples??). Usually I get really annoyed when local Indian people try to help me, because usually they want money (at least, that was our experience in India, I’m sorry if I sound catty). But this time, it just naturally happened. He was so dedicated in taking the shots. After a few minutes we already took about 50 photos that I was so happy with. Yes, the Taj Mahal was in the fog, but we could see it. Definitely if we got closer. And it was beautiful. It’s definitely worth all the fuss. Maybe it’s because we were almost the only ones there, but it was such a magical place. We walked around and after saying our goodbyes to Raja, we decided to sit and just enjoy the moment. Eventually it did get busier, but not as busy as we expected. For us, it was definitely worth all the fuss. The beauty, the story behind it… And I guess we were just super lucky it wasn’t busy at all. Ah thanks Jes!! You are right, it kinda does! Your pictures are gorgeous! I would love to visit there. Thank you! It is definitely worth the visit :).